All WhatsApp users know very well about the check marks shown on the WhatsApp. When you see double blue check marks which means recipient has read your message. Sometime you need to know how to read WhatsApp messages without sender knowledge. Lot of novice WhatsApp users don’t know about this trick. Let’s we discuss tricks to read WhatsApp messages without sender knowledge in this article. There are billion of WhatsApp users around the world. You can easily send any messages text, video, audio either to a single person or in a group. We already discuss how to check when message is read in our previous article. When recipient has read you message you will get double blue check mark on your screen. It is the final confirmation that your message shown by the recipient on WhatsApp. If you don’t reply to your close friend, family member or colleague message, they can complain to not giving reply of his message. Sometime due to the advantage of this feature you have to face problem. If you get any message from any person on WhatsApp and don’t want to reply, the sender feel you have ignored him. It’s a difficult situation what to do at this time. Now, there is no need to worry you have to easily read WhatsApp messages without sender knowledge. 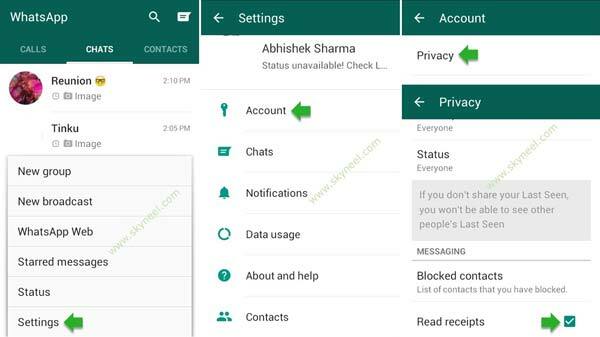 These given simple tricks helps you to read WhatsApp messages without sender knowledge. After reading any message double blue check marks send an acknowledgement to the sender that your message checked by the recipient. If your close friend, family member, colleague complain to not reply his message or try to ignore him. It’s create a dramatic situation and you would not be able to satisfy them. In that situation you have to put you phone on “Airplane/Flight” mode and check the message. Now close the WhatsApp window and again turn-off Airplane mode. It’s best tricks to read WhatsApp messages without sender knowledge. It is the best way to read WhatsApp messages without sender knowledge. When you turn off read receipts option sender is not able to view double blue stick on his screen. But there is drawback of this feature, you can also not able to view double blue check marks when someone has read your message. If you don’t have any problem about this then let’s start how to disable read receipts option on WhatsApp. Step 1: Active WhatsApp on your smartphone. Step 2: Tap on the “Settings” (three dots) option. It’s placed at the top right corner on you WhatsApp window. Step 3: Tap on the “Settings” option. Tap on the “Account” option in the “Settings” window. Step 4: Tap on the “Privacy” option in the “Accounts” window. Now, un-check the “Read receipts” option. After that you can’t see read receipts from others. It is another trick to read WhatsApp messages without sender knowledge. After receiving any message on WhatsApp turn off your Wi-Fi or Mobile data connection. Now, when you are offline you can easily check the message without sender knowledge. After reading all the message when you are offline close the WhatsApp. Now again turn on WI-Fi or Mobile data connection on your Android phone. When you get any sender message on your WhatsApp, it shows a notification on you notification bar. It is the another important trick to read WhatsApp messages without sender knowledge. You have to simple swipe down the notification message on your phone. Now you can easily read complete or partial message of sender without opening the WhatsApp window. Double blue checks shown only when you open the WhatsApp window and read the message. If you swipe the notification bar and read the message than sender does not have knowledge about this. I hope after reading this article you can easily read WhatsApp messages without sender knowledge. It stop someone to complain to not reply his message on WhatsApp. If you have any suggestion regarding this article than write us in the comment box. Thanks to all.